Q. How can I add or edit a title in the title field in my RefWorks 2.0 folder? It isn't working. According to RefWorks (as of Dec 2011) this is a known problem usually affecting people using Windows 7 and Internet Explorer 9. "This is caused by a change in MS Internet Explorer in version 9 on Windows 7 machines. IE9 no longer recognizes the coding we use to enable users to edit rich text fields that provide the ability to format them, e.g. bold, underline, italics. To address this, we have been forced to ask users to employ what is known as "compatibility mode" in IE9." 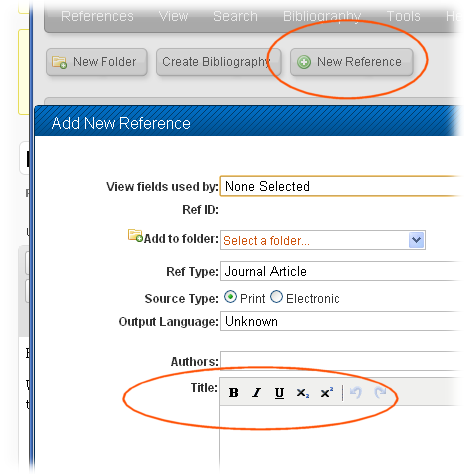 When adding a new reference using the new RefWorks 2.0 interface you may find that the Title field is inactive – the cursor doesn’t appear and you will be unable to type anything in the field. First, try closing and re-opening RefWorks. Sometimes this helps. Second, enable IE9's "Compatibility View": Look to the right-hand side of the browser address bar for an icon that looks like a white piece of paper torn in half. Click on this icon to turn it blue. This enables IE9 ”Compatibility View“ and makes it possible to enter text into the Title field in RefWorks 2.0. Or access the Tools menu in IE9 and then select the Compatibility View option so that a checkmark appears next to the entry on its left. An alternative workaround is to install/use a different browser such as Firefox.